"White House Says It Routinely Overwrote E-Mail Tapes From 2001 to 2003"
"White House Copied Over E-Mail Tapes"
"White House discloses details of e-mail backup system"
"Missing e-mails should be on backup tapes, White House CIO says"
Washington DC, January 16, 2008 - In response to a federal court order issued last week, the White House late last night refused to acknowledge any missing e-mails, instead stating that it “has undertaken an independent effort to determine whether there may be anomalies in Exchange e-mail counts” during the 2003-2005 period. A sworn statement by the Chief Information Officer of the White House Office of Administration filed with U.S. federal court just before midnight admitted the White House had recycled its e-mail back-up tapes before October 2003 and only began retaining the back-ups starting at that point. "Two years after a special prosecutor concluded that key e-mails were missing from the White House system administered by the Office of Administration, the White House astonishingly now admits it has no back-up tapes from before October 2003 and doesn't know if any e-mails are missing," said Tom Blanton, director of the National Security Archive. 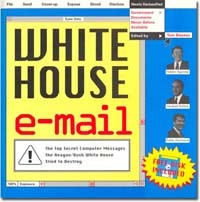 The loss of White House e-mails first surfaced on January 23, 2006, when prosecutors in the Scooter Libby matter informed Mr. Libby’s defense counsel that they were unable to provide copies of e-mail records “because not all email records from the Office of the Vice President and the Executive Office of President for certain time periods in 2003 was preserved through the normal archiving process on the White House computer system.” The full scope of the problem was not appreciated until April 2007, when Citizens for Responsibility and Ethics in Washington (CREW) issued a report stating that over 5 million e-mails were missing throughout the Executive Office of the President. At that time, White House spokesperson Dana Perino acknowledged the lost e-mails. “This declaration may mean that records about policy and decisions in the Executive Office of the President are not entirely lost, but in many respects it raises more questions. We still do not know what was lost, why it was lost, and what steps we have to take to recover it--assuming it is still recoverable,” explained Ms. Fuchs. On January 8, Magistrate Judge Facciola of the U.S. District Court for the District of Columbia ordered the White House to answer a series of questions about the missing e-mails, asserting that the information was “time-sensitive” because any back-ups of the missing e-mails “are increasingly likely to be deleted or overridden with the passage of time.” Judge Kennedy had previously ordered the preservation of e-mail back-up tapes held by the Executive Office of the President (EOP) in the consolidated lawsuits filed by the National Security Archive and Citizens for Responsibility and Ethics in Washington (CREW).